Delhi CET 2019 application form will be available online for the interested students from 1st April 2019 onwards. Delhi CET (Common Entrance Test) is a state level polytechnic exam and it is conducted by the Department of Training and Technical Education (DTTE). 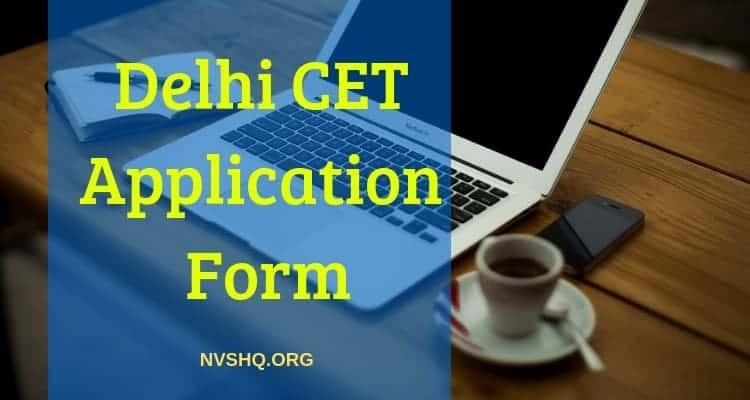 Delhi CET Application Form 2019 direct link will be provided here. CET is also known as Delhi Polytechnic exam conducted to offer a polytechnic course to desired candidates. In this article, we have compiled all the essential information related to Delhi CET exam, application fee, important dates, eligibility and exam pattern. Delhi CET (Common Entrance Test) is a state level exam conducted for providing admission to interested students in full-time diploma courses in engineering & non-engineering courses. To apply for Delhi CET the applicants need to fill the Delhi CET application form. The application form will be available for the interested applicants in online mode from the 1st April 2019. Here we have mentioned all the important dates associated with the Delhi CET exam 2019. Here we are mentioning the application form release date with other tentative dates related to the Delhi CET 2019 exam. We will update this tentative information once we will get the some confirmed update on a new session in Delhi CET 2019. The online application form will be available for the applicants to apply for Delhi common Entrance Test from 1 April 2019. The last to apply for the aforementioned test will fall in the 3rd week of April 2019. Admit cards will be released to the students to appear in the exam in the Third week of May 2019. Date of entrance exam for Delhi CET may fall in the Fourth week of May 2019. Result for Delhi CET 2019 will be declared in the Second week of June. The first round of counseling will start in June and in the same month the result of counseling will be declared. The result of 2nd, 3rd and 4th counseling and printing of provisional allotment letter will be done by the authorities till the last week of July. Online willingness for spot round will be conducted in the first and third week of August. Candidates seeking admission to diploma courses offered by polytechnic institutes in Delhi should make a note of the above mentioned dates and keep visiting us for more updates on Delhi CET 2019 exam. This will help the interested students to have a track of all the important dates of the Delhi CET exam. The application form to apply for Delhi Polytechnic for 2019, will be available online on the official website of CET. Here are the steps to apply for the Delhi CET. Note that to apply for the CET 2019, the applicants will need their Aadhar Card and PAN Card. Those candidates, who want to apply for multiple tests, need to fill multiple forms also. First, the candidate will have to complete the registration process. To complete the registration process the candidate will have to visit the official UPL to for the registration of Delhi CET Polytechnic test. Then, enter all the asked information about the applicants like candidate’s name, gender, parent’s name, communication details and other. You will have to mention your mail id, mobile number and create a password. Once the candidate gets registered, now he can fill the Delhi CET 2019 application form. To fill the application, the candidate will have to mention his personal and educational details and also need to mention the test; he/she is applying for. After giving all the essential information asked in the application form, now the candidate will have to upload his/her scanned photo, thumb impression, and signature. Candidates will have to make sure that the size of all the scanned documents should be same or lesser than the given size limit. After completing the aforementioned process, now the applicants will have to pay the application fee for Delhi CET 2019 application form. The application fee will be Rs. 400 (excluding bank charge of Rs. 15 and GST of Rs. 3). Candidates can pay the application fee through debit or credit card or online payment. As the last step, you can now submit the application form after confirming that it is complete with all correct information. Do not forget to take a print out of application form for further use. Delhi CET 2019 exam will be conducted at the exam center located in Delhi only. Delhi Polytechnic exam 2019 is divided into 4 categories; Test 1, Test 2, Test 3 and Test 4. In Test 1, a course like Applied Art, Civil Engineering, Automobile Engineering, Chemical Engineering, Mechanical Engineering, Printing Technology, textile design, etc are included. The list for test 1 courses is really long. Test 2 is for those candidates who want to take admission in modern office practice in Hindi and English language. Test 3 is designed for those candidates who want to take admission in Pharmacy. Test 4 is for those candidates who want to take admission as a lateral entry. Test 4 is available only for the Delhi region students. Before applying for the Common Entrance Test for Delhi Polytechnic 2019, first, check the eligibility criteria set for the applicants by the DTTE. For Test 1 the applicant should have cleared the class 10th or its equivalent from CBSE or state board. For test 2, the candidate must have passed class 12th or their equivalents from any government approved education board in any stream. Candidate should obtain a minimum of 35%marks in the aggregate of the best three subjects. To apply for test 3, the candidate must have passed 12+2 with Physics, Chemistry, Maths or Bio. For test 4, the candidate must have passed 12+2 with Physics, Chemistry, Maths or Bio. OR Passed 10th + 2 years ITI course. To apply for Delhi CET 2019 the applicants’ age limit should be 21 to 28 years. For the different test, a different age limit is set by the authorities. Candidates from reserved category will get some relaxation in the upper age limit as per the rules. The entrance exam for Delhi Polytechnic will be conducted in offline mode and it will be pen and paper-based exam. Here is the essential information related to the Delhi CET 2019 exam. Mode of Exam will be Pen Paper based. Duration of Exam will be 2 hours 30 minutes. Total of 150 questions will be asked in Delhi CET. A number of questions for the Pharmacy course will 210. Teat 2 will be conducted in English and Test 3 will be conducted in Hindi. Rest all tests will be bilingual and will be conducted in Hindi and English both. For every correct answer, the student will score 4 marks. Negative marking will be applied in Delhi CET 2019 exam and with every wrong answer, the candidate will lose 1 mark. To reach the official website of CET Delhi 2019, click here. If you have some question in mind related to the Delhi CET 2019 application form and exam then feel free to write to us in the comment box below. Can UP students also apply for this exam CET??? Which thumb impression is required left or right ? ?